REUTERS/Carolyn Kaster/PoolThey weren’t actually this close. The nuclear negotiations between Iran and a US-led group of countries over Tehran’s nuclear program have once again fallen short. On the one year anniversary after the signing of the landmark Joint Plan of Action in Geneva, diplomats from Iran and the PP5+1 — the five permanent members of the UN Security Council and Germany — announced that the negotiating period will be extended for another seven months after the parties failed to reach a final deal during a marathon session in Vienna. This round of talks was punctuated with reports that the P5+1 had softened its position on issues considered central to resolving the nuclear standoff. The Jerusalem Post cited an anonymous Israeli official claiming that the P5+1 offered a deal that would expire after only ten years. 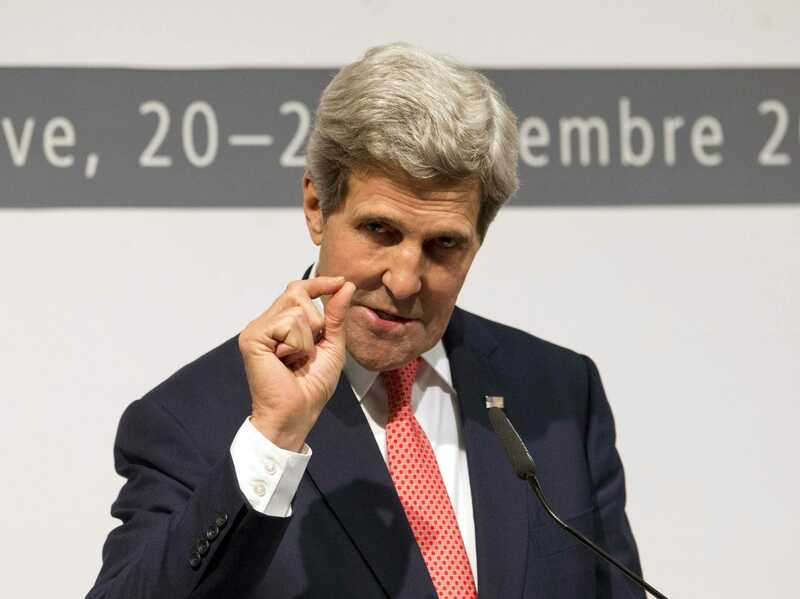 News reports and expert analysis suggested that the US was willing to allow Iran to leave as many as 5,000 uranium centrifuges in place under a final deal, effectively conceding that Iran would be able to keep much of its uranium enrichment infrastructure even after an agreement was signed. And the Wall Street Journal reported that the P5+1 was no longer demanding the closure of Iran’s heavy water reactor at Arak — a facility capable of producing weaponised plutonium — and didn’t plan on using the deal to scale back Iran’s ballistic missile program. The P5+1 was reportedly willing to settle for an agreement that delivered a strict verification regime theoretically capable of cutting off Tehran’s pathway to a bomb — while leaving in place much of the infrastructure needed to actually build and deliver a nuclear weapon. It’s an arrangement that would seem to favour Tehran in some respects, winning it sanctions relief along with some limited international recognition of the legitimacy of their nuclear program. So why didn’t Iran take it? And given that the negotiations have gone on for over a year now — with a White House committed to a negotiated way out of the nuclear impasse — what else does Iran really think it can get out of the process? One possibility is that Iran simply doesn’t want a deal or isn’t in a position to sign even a generous one. Iran is a compartmentalized authoritarian state with several often-competing and only semi-accountable centres of power. If one of them doesn’t want a deal — if, for instance, Supreme Leader Ali Khamenei winces at the possibility of any grand bargain with the west — it isn’t getting done. It’s easier, from that perspective, for Iranian negotiators to keep extending the talks rather than dealing with the implications of a final deal, especially when Iran will be allowed to access an additional $US700 million a month in frozen assets as long as the talks continue. Another possibility is that Iran’s intransigence is not only intentional but actually a highly effective negotiating tactic. As Tom Moore, a former Senate Foreign Relations Committee staffer and Luger Center senior fellow who has followed the Iranian nuclear issue for over a decade explained to Business Insider, Tehran’s strategy towards the US hasn’t actually changed much over the years. Iran has always used the possibility of near-term concessions to keep the west interested in negotiating — while slowly building its program and resisting a final resolution to the nuclear issue. 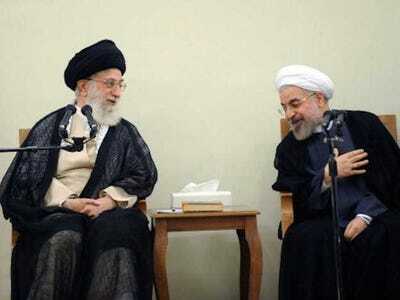 Anadolu Agency/Getty ImagesSupreme Leader of Iran Ali Khamenei (L) meets with Iranian president Hassan Rouhani in Tehran, Iran on July 14, 2014. “They have made the decision they get more out of doing this than out of a final deal,” Moore says of the post-Geneva agreement series of negotiating extensions. Moore recalled the 2004 Paris Agreement between Iran and three EU countries, in which Tehran agreed to curtail certain aspects of its nuclear program. The deal came around the same time Iran agreed to the International Atomic Energy Agency’s additional protocols for nuclear monitoring. In taking an incremental approach, Iran gets the benefits of a short-term agreement — benefits like sanctions relief and diplomatic good will — while not giving up anything major and at least preserving the long-term option of ramping up its program again. In that respect, the Geneva interim agreement is actaully favourable for Tehran, as Mark Dubowitz, executive director of the Washington-based Foundation for Defence of Democracies, explained to Business Insider. The Vienna extension suggests that Iran doesn’t really see much urgency in completing a deal — or even that only one side thinks there’s much of a benefit to a comprehensive nuclear agreement. If an agreement comes it may be less far-reaching than a lot of observers hope, with an over year-long negotiating process lurching towards an anti-climactic end.